Reposting old, non-show tweets as an archive. Because if I don’t, data might be lost, and then … data might be lost! When I began, there were 317 tweets, minus the ones already posted from shows. I also skipped the tweets that are notifications of blog posts. Even I’m not that tight. Opened RS Twitter account. Brilliant idea or time sink? Gratuitous Kitten Squad dropped off at vet's for snippage. Not predicting a productive day chez moi. Kitty castrati are home. Owner relieved. Kittens less so. Nice riding dream. Didn't want to want to wake up. Good to know my mind can do the positive once in a while. Much rain, dry barn. Is there a nicer sight than content horses? Lesson today. Video slightly closer to my imagination. Lola's mix tape: walk to The Kinks, trot to Copacabana, canter to Damn Yankees. Taking a Twitter break until I figure out what to do with it. Well, that was easy. Most of my first foray into Twitter was using it as an ersatz RSS feed. 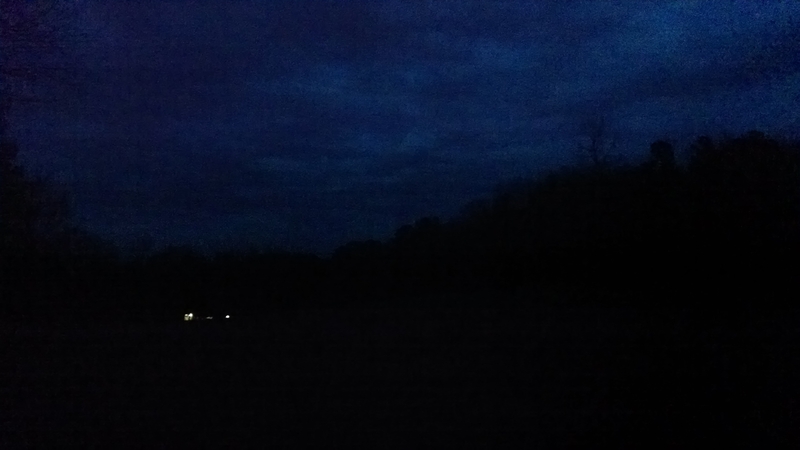 The barn lights from the far corner of the field at twilight.